Anthony DiComo at MLB.com selects his players most likely poised for a breakout in 2008. 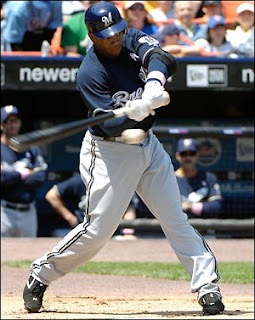 Rickie Weeks is at the top of his list (mine too). [H]is batting stroke returned -- he hit .327 in August -- then his power followed. Nine home runs over the final month were reminder enough that this former first-round Draft pick has yet to play a full season in the Majors. He has yet to prove all that he can do.